You’ve got a few options for how you set up your workflow with regards to getting your 360° videos and photos from the KeyMission 360 to a compatible smartphone or tablet, personal computer and ultimately the web for viewing and sharing. For still photos and short video clips, you can download the files from the camera to your compatible smart device using the SnapBridge 360/170 app. This works best for stills and short videos. You probably won’t want to use this method for longer videos, because a one minute 4K UHD video (which the KeyMission 360 records in) will take about four minutes to download via Wi-Fi®, depending upon the strength of your Wi-Fi network. For longer videos, or to download a day’s worth of captured video footage and still images, you have a few options. You can use a card reader, a Lightning to SD card adapter for iPhone®/iPad® devices or a mini USB to SD card adapter for Android™-powered devices, or connect the camera to your Mac or Windows-based computer using the included USB cable. A card reader is a quick and easy solution for downloading large files or a large number of files to a computer for editing, viewing or sharing. They’re manufactured and sold by the companies that make media cards, so you should be able to find one where you purchased your SD media cards. Most card readers connect to a computer via USB and are usually compatible with both Mac and Windows-based PCs. The KeyMission cameras use microSD cards, which are tiny. When you purchased your microSD card, it likely came with an adapter to allow it to be used with full size SecureDigital (SD) card readers. You simply slip the microSD card into the SD card adapter and place that in the card reader. Apple makes an adapter (its called a Lightning to SD Card Camera Reader) that connects to your iPhone® or iPad® via the lightning port on one end and it has a slot for an SD card on the other end. When you purchased your microSD card, it likely came with an adapter to allow it to be used with full size SecureDigital (SD) card readers/adapters. To view or download images and videos to your smart device, you simply slip the microSD card into the SD card adapter and place that in the Lightning to SD card adapter. A number of companies manufacture similar adapters for Android™ users. These adapters feature a micro USB interface on one end and SD card reader on the other end. You would use it the same way as described above for iPhone®/iPad®. If you want to download photos and videos to a computer and don’t have a card reader or adapter, you can use the USB cable that was supplied with the KeyMission 360 camera. 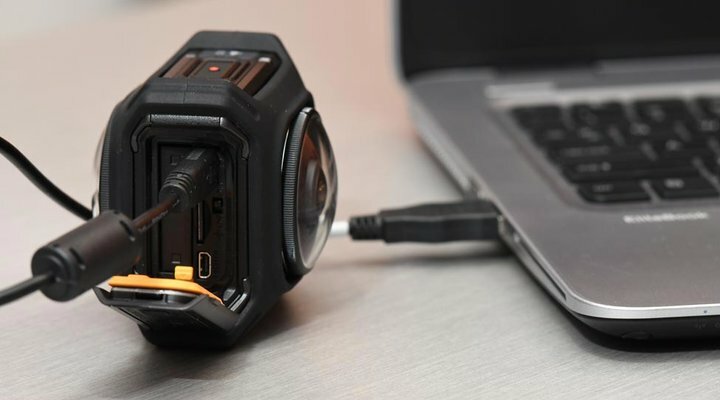 Simply plug the micro USB end into the port in the battery/card compartment on the KeyMission 360 and plug the other end into the USB port of your Mac or Windows-based PC. You can then view, download, edit and share your photos and videos. The potential for 360° capture and storytelling is unlimited. How we share stories, important moments and special events in our lives are evolving into an exciting new interactive way. To view your KeyMission still photos or videos in full interactive 360 degrees, you will need to view it from within the SnapBridge 360/170 app on your smart device or from within the KeyMission 360/170 Utility software on your Mac or PC. Whether from within the SnapBridge 360/170 app or the KeyMission 360/170 Utility, you need to select the option to “Add YouTube metadata”. We recommend you keep the original file and have the app/software create a copy with the YouTube™ metadata. You also have the option to overwrite the original file if you choose. Even though the app only says YouTube™, it is preparing the file for Facebook as well. Once the file is prepared, you just need to upload it to YouTube™ or Facebook. On the app, this is done via the share option. In the Utility software, its done via the Edit tab. Select the option “Save for YouTube” which is in the edit menu. You can choose a new filename and select where on your computer the file is saved. Once saved, the file is ready for uploading to Facebook or YouTube™. After uploading to Facebook or YouTube™, you can view it interactively on those platforms using your smart device or mouse with your computer to move around and view the entire 360° content. And your friends can do the same!